This coin may be inlaid for free in any plaque of a rotor blade from a military helicopter. Simply choose this coin in the "Military Branch Challenge Coin" option when configuring your plaque. Originally founded in 1914 as the aviation division of the Army Signal Corps, the modern United States Air Force was founded in 1947. Since its inception, the Air Force has played a vital role in strengthening America's homeland security and advancing the cause of freedom throughout the world. Recognized as the global leader in the development of air and space technology, the Air Force provides the United States Armed Forces with a distinct advantage. Through the command and control of the world's most advanced intelligence gathering communications systems, Air Force personnel deliver critical support to American forces engaged in combat and enhance America's capacity for domestic defense. 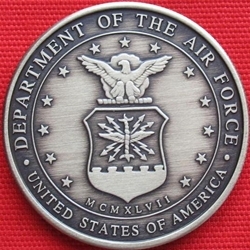 This coin honors the commitment of the United States Air Force to develop and exploit aerospace technology in the defense of America's global interests.